More parents seem to have gotten the message that their infants need to sleep on their backs to reduce the risk of dying from Sudden Infant Death Syndrome (SIDS). However they seem to be unaware that often multiple risk factors occurring at the same time increase the risk of SIDS, according to new research published Monday. Back in 1994, a campaign called "back-to-sleep" was launched to encourage parents to place their infants on their backs when they sleep to prevent SIDS, the leading cause of death among babies aged 1 to 12 months. And it helped: 10 years later the death rates from SIDS were cut in half. But around 2000 those rates began to plateau and new research published in the journal Pediatrics suggests it may be due to an increase in other risk factors for SIDS such as bed-sharing and having babies sleep on adult mattresses and bedding. Researchers studied the records of 568 SIDS babies in San Diego, California, who died between 1991 and 2008 - before and after the 'back-to-sleep' campaign began. Scientists wanted to find out if the prominent risk factors for SIDS deaths had changed over time. Experts know that the chance of developing SIDS increases when a baby sleeps on his or her stomach, shares a bed with someone, is born premature and if the mother-to-be smoked. In this study, scientists found that the biggest risk for SIDS, stomach sleeping, had dramatically dropped during the 17 year period, but the amount of bed-sharing had doubled, especially in babies younger than 2 months old. Experts say children are twice as likely to die from SIDS when they sleep in the bed with someone else. If an infant is very young (between 2 and 4 months old) these rates go up dramatically. "Bed-sharing leads to a 17 or 18 times increase risk [of SIDS] if the baby is less than 2 or 3 months old," explains Rachel Moon, Pediatrician and SIDS Researcher at Children's National Medical Center in Washington. And if the parents bed-share and smoke, the baby is 18 times more likely to develop SIDS even if the infant is older than 3 months of age, says Moon. This new research suggests that parents need to be educated that their newborn is at risk for multiple and simultaneous SIDS risk factors, not just one. Simply having your baby sleep on his or her back, isn't enough. If your baby hasn't reached his or her first birthday and sleeps with you or on soft blankets or mattresses, those are risk factors too. "Risk reduction campaigns that emphasize the importance of avoiding multiple and simultaneous SIDS risks are essential," according to the study authors. SIDS takes the lives of about 2200 infants each year in the United States, according to the Centers for Disease Control and Prevention. 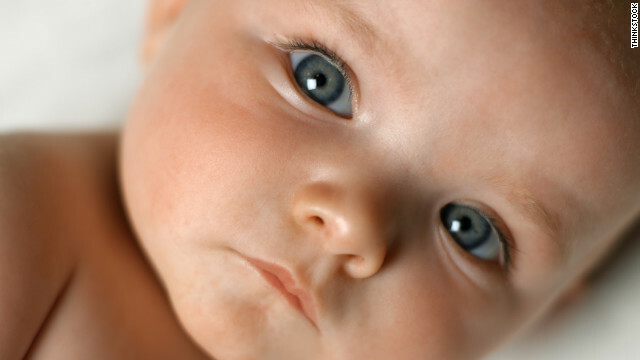 Most infants who die are between 2 and 4 months of age. Experts are still grappling with the cause but think is has to do with abnormalities in the part of the brain that control breathing and the ability to wake from sleep. These babies are less likely to rouse themselves if they are face down or if blankets, pillows or other bedding obstructs their breathing. Next entry »Could eating chocolate make you thinner? I am glad this article emphasizes breastfeeding but would like to have seen the statistical difference of SIDS in breastfed babies and babies that were not breastfed. Surprised they didn't mention this but there are specially made bassinets that give your baby a safe place to sleep next you in bed. We are planning on using one for our next baby especially if I end up having another c-section and have a hard time getting out of bed at first. Even more proof that the parents who co-sleep are just plain STUPID! If you sleep with your baby with you in bed, you are doing nothing to prevent that kid from dying – chances are you'll roll onto baby in your sleep and kill it. Try living with that on your conscience for the rest of your life...no, thank you. So be a responsible parent and get that kid its own damn bed. Hannah: "chances are you'll roll onto baby in your sleep and kill it." Actually, given the rate of co-sleeping world wide chances are that you will NOT roll over onto your baby and kill it. Your statement is false. Actually, Hannah, to use your language, I think parents who don't co-sleep are just STUPID. A baby spends 9 months forming in its mother's body – being lulled by her heartbeat and the rhythm and sounds of her being. After they are born and completely new to this world, placing them all by themselves in a crib or bassinet is just cruel. It rips them away from everything they were formed with and are comfortable with and leaves them alone in a new world. Babies who co-sleep often sleep better and longer because they are around what is familiar to them. They often sleep better later in life, too, because they don't experience the trauma and fear of being away from mom those first crucial months. As they mature and develop, it is usually easier to transition them to their own bed and you have less problems doing so. Co-sleeping can be very safe if done effectively, and is a thousand times better emotionally for the baby. We need a real study that compares seperated sleeping to safe co-sleeping practices. I agree absolutely Christine. We also need to examine why the rate of SIDS deaths are changed. It may have to do with diagnosis. As forensic science improves it may just be that a lot of cases that perviously would have been classified as SIDS are now being recognized as being the results of shaken baby syndrome. There is also new and scant research on SIDS and infant hearing tests (infants with hearing damage) may effect breathing. I really wish they would spend more research dollars on the hearing damage in newborns and the potential correlation to SIDS. Linda you said, "I am very sorry for the loss of your baby brother. SIDS infants do die in cribs, that does not make the crib the causal factor." Babies also die of SIDS in their parents beds. That does not make the parents bed the causal factor either. It could be on any given night a baby is going to die of sids no matter where it is sleeping. Risks factors are not causal but your statements indicate that you are treating them as such. CNN's reporting of this study does not break down whether the causal risk factors detailed in previous studies quoted above were broken out of the study data. If you told me there was a study that said newborns are always safer in an infant car seat as opposed to a convertible car seat, I would say what are the risk factors you considered and excluded. Was the convertible seat installed correctly, where the instructions regarding appropriate weight (infants must weigh > 5lbs) and health considerations followed etc etc. Maybe the study has done this and CNN just didn't report it correctly (wouldn't be the first time). Until that information is known, the study data and conclusion are worthless. Hannah, where do you think babies sleep in countries other than the U.S. and those in Europe? In the parents' bed, that's where. My husband is from India and when we visited (with our infant son), using a crib wasn't considered an option at all. It never would've occurred to anyone to use one. Shockingly, SIDS is vritually unheard of in most countries where bedsharing is common. The common practice in India is to have a bed large enough for parents and frequently more than one child. The difference is that beds in the U.S. are extremely soft and we use a lot of blankets and pillows. In India, there's a thin cushion on top of a wooden bedframe and one blanket, as opposed to a duvet or other fluffy bedding. Having our kids in bed with us meant that nighttime nursing was far easier than it would've been otherwise, everyone got to sleep and both children moved easily from our bed into theirs when having them in bed became too disruptive. A large issue instead is that parents aren't often taught safe ways to bedshare. If you have a squishy surface or need lots of covers, you shouldn't have a baby in bed with you. If you're an extremely heavy sleeper or using drugs and/or alcohol, don't have a baby in bed with you. It's simple common sense. And for what it's worth, we didn't bring our firstborn into bed with us until our son's pediatrician explicitly recommended it. He was a terrible sleeper at first, so she told us how to set up our bed in such a way that having him there with us was safe. We followed her directions and the first night we tried it was the first night we had all gotten a full night sleep in months. This article, and many others like it, continually fail to recognize the reasons behind many parents' decisions. With our youngest child, we had no intention of bed sharing, and followed all of the "Back-to Sleep" recommendations. Unfortunately, even being exclusively breastfed, he had terrible reflux issues, and slept best on his stomach. He was literally waking every 20-30 minutes on his back, but would go 3 hours straight between feedings if he slept on his stomach. Sleeping on his back was having serious effects on him and us in the form of sleep deprivation and susceptibility to colds. Further, once he was in day care, he did a feeding schedule called reverse cycling where he would tak very little breastmilk in his bottle when he was away from me, but would nurse far more often at home. In order to function at work, I had to get some sleep, so he was in bed with us much of the night, and on his tummy when he was in his crib. Thank fully, our bed firmness and other factors made aco-sleeping a pretty safe experience. Regardless, it is easy to list all of these factors, but out in the real world there are other issues with the families and babies themselves that force parents to make choices. Parents need to be given the information, but it's currently presented in a way that makes you feel like your choices are to do things exactly as they tell you or your baby will die. I find it interesting that up to 42% of parents admit to allowing their babies to stomach sleep, even before they can roll over. I am confident many of them faced the same problems we did, but have been afraid to say anything because we like to shame parents who don't follow the rules. I would love to see far more research go into this to help parents make the best choices for their families. First baby was lay on stomach so she doesn't choke, second was on back baby will turn head and not choke, third was lay on side and use wedges, grandbabies just a blanket sleeper on their back and always have fan on so bad air doesn't have a chance to build up. I think this last recommendation is the best and makes the most sense. But my first advice would be don't take your baby for granted, be vigilant. Everything matters when it comes to your baby. Just curious if this is Leslie Wade who used to work at the National Academy of Sciences. If so, well done. You don't "develop" SIDS. SIDS is a diagnosis of exclusion. It is the cause of death, not an actual affliction or illness. This article is misleading. Also, most infants who die in their parents bed die from suffocation. SIDS and Suffocation are two distinct and seperare causes of death. I wish the media would get this straight. Are there any studies on vaccinations and SIDS? Seems like the spike in SIDS occurs about the time babies receive their first set of shots. Please note that I have 5 children and all are vaccinated, I am just curious if any studies have been done in relation to the use of vaccines and SIDS.